German Talmudist and payyeṭan; born about 1030; died at the end of the eleventh century in Speyer, Rhenish Bavaria. He studied at the yeshibot in Mayence and Worms, having Rashi as a fellow student. 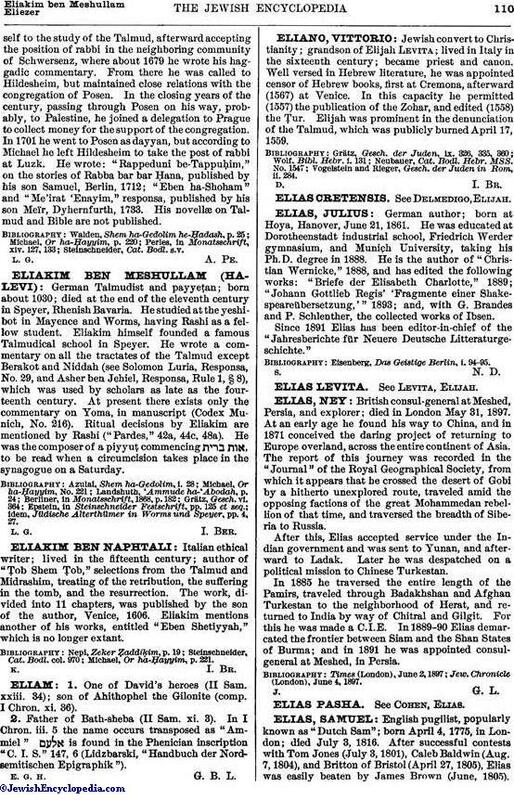 Eliakim himself founded a famous Talmudical school in Speyer. He wrote a commentary on all the tractates of the Talmud except Berakot and Niddah (see Solomon Luria, Responsa, No. 29, and Asher ben Jehiel, Responsa, Rule 1, § 8), which was used by scholars as late as the fourteenth century. At present there exists only the commentary on Yoma, in manuscript (Codex Munich, No. 216). Ritual decisions by Eliakim are mentioned by Rashi ("Pardes," 42a, 44c, 48a). He was the composer of a piyyuṭ, commencing , to be read when a circumcision takes place in the synagogue on a Saturday. idem, Jüdische Alterthümer in Worms und Speyer, pp. 4, 27.